A listing of the ideal neighborhoods among Sarasota real estate properties near Interstate 75 should include Three Oaks. This community is just off Proctor Road, only about half a mile from the Interstate. It is composed of 274 residences constructed during the twenty-year span of the 1990s and the 2000s, thus presenting a wide range of home designs prevailing during that period. 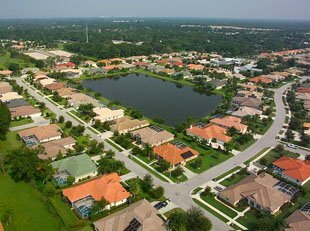 This subdivision is essentially composed of single family homes, mostly custom-built residences with their own private, caged pools. 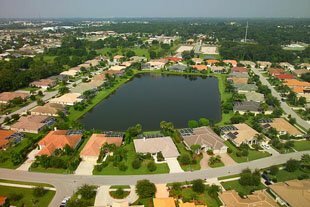 From a bird’s eye view, the entire community creates a distinctive shoe shape formed by its main street, Eastwind Drive, looping around the property. The calf section of the enclave is dominated by a fairly large lake around which a number of choice residences were built. As refreshing, the north-northeastern perimeter of the subdivision is next to lush woodlands, a nature preserve with several ponds and lagoons therein. The professionally landscaped tropical setting of the Three Oaks real estate development is complemented by the superb features of its residences. Each home is impressive with their volume ceilings which provide an abundance of natural light within the residence. Select residences have private pools with waterfalls, double-door grand entrance, and crown molding throughout. With lot sizes of as much as over 21,000 square feet, these properties count among Sarasota homes for sale with spacious acreage. The floor plans of sales-listed Three Oaks residences typically range from 2,000 to 3,000 square feet, featuring three to four bedrooms. Three-bedroom dwelling built in the early 2000s with floor spaces of between 2,200 and 2,500 square feet can have a tag price in the mid-$300s to mid-$400s. The quotes can move to the high $400s for Three Oaks Homes for sale having floor plans in the 2,500–2,700-square-foot range. Definitely a good choice for young families, Three Oaks is conveniently close to schools like Ashton Elementary, Sarasota Middle, and Sarasota High. For recreation, several parks are only a short distance away from the community. Among these are the Urfer Family Park, Bee Ridge Park, Red Bug Slough, and Twin Lakes Park. Health care facilities are as easily accessible at the Sarasota Memorial Hospital a short drive north on Bee Ridge Road. Retail shops like Walmart Supercenter on Cattlemen Road are nearby too. For the golf and country clubs that Sarasota is noted for, the logical choices include the links of the Grove and Bobby Jones north of the Three Oaks as well as the Lakewood Ranch layout northeast of the subdivision. Superior shopping and dining venues can also be reached with a few minutes’ drive toward the southwest at the Westfield mall whereat the AMC 12 can likewise provide movie entertainment. A short westerly drive from the community, in addition, leads to the white sands of Siesta Key whose very allure sealed many a deal on Three Oaks homes for sale.